With the massive popularity of fitness trackers, it was only a matter of time before pets got in on the action with activity monitors of their own. These pet wearables hang from your pooches collar and can track their activities using accelerometers that measure motion. It is the same technology that you find in the most famous human activity trackers like Fitbit. While most owners are very aware of just how much (or little) exercise their pet is getting, these wearable devices give you in-depth data not only on how much walking or aerobic play they get, but also info on how many calories they burn. Some devices monitor breathing and heart rates, and you can even log meals and keep track of medication. Since all dogs are different, picking the best activity tracker is all about figuring out which device offers the best combination of features that will work with you and your pets fitness goals and health needs. What are the Benefits of Getting a Dog Monitor? Getting pet owners motivated to increase their pet’s activity level is the significant benefit of pet activity trackers. For some pet owners walking your dog slides down the list of things to do with within a busy life, but if you are finding that activity levels are down, you will get that extra encouragement to help you get going and keep motivated. It, in turn, will keep your pet healthy and happy. Sadly there are a lot of overweight pets, some reports suggesting more than half of the dogs in the U.S are overweight or obese. Carrying excess weight can lead to all kinds of health problem, so it makes a lot of sense to keep active and fit. Another reason to use these types of products is that it can help track abnormal behavior in your pet, alerting you to illness or medical problems that you may not be aware of. They are also very useful for owners whose dogs go to doggy daycare or are left in the care of dog walkers, so you can check if your pooch is getting as much exercise as you are paying for. Just like human fitness trackers, the primary technology used in most of these devices is a three-axis accelerometer. Accelerometers measure either up and down, side to side, or front to back. When the accelerometer isn’t moving it only records the force of gravity when it moves it marks the acceleration, although its primary function on most of these types of devices is to count steps. Three-axis accelerometers are very inexpensive these days, so a lot of start-ups are using them in different kinds of products with varying degrees of success. When used in pet fitness trackers the accelerometer is added to a tag or device worn on the pet’s collar. The tag then sends the data that is collected to an app that the owner has installed. The app processes the information using software algorithms to analyze the motion and estimate the amount of activity (or lack thereof) your pet has reached in a day, as well as other reports. Some activity trackers include other sensors that are common on human trackers like an ambient temperature sensor that can let you know when your dog is too hot or too cold. In general, most trackers will last between one to two weeks on a charge. Most charge by using a USB connector that you plug into your computer to charge. Having a device with GPS lets, you keep track of your pooch, which is especially useful if they are prone to wandering off as many dogs like to do. Keep in mind if you go for a product with GPS, you will have an additional monthly fee for using the GPS service. So a GPS enabled devices aren’t necessarily the best choice for everyone. If you have a very active dog that spends a lot of time outdoors, you will want to get a monitor that will be able to withstand what your mutt can put it through. If you are worried about the durability of a product, pay close attention to the warranty and the company’s reputation for replacing defective devices and faulty parts. 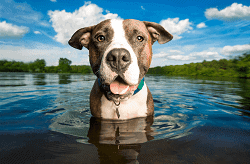 If you have a dog that loves to swim and makes a beeline for any areas of water that they can find, be sure to get a monitor that is waterproof not just water resistant. All of the products listed in the table above are waterproof. Considering your pet will be wearing the tracker almost all the time, it is essential that you make sure it will be light and comfortable to wear. Think about the weight of the attachment, the shape of the design may also be a factor to consider. To use the monitor, you will have to regularly “sync” (transfer) its data to your computer or one of the apps. Syncing your data ensures that you can see all your pets activity history and other data that is collected. Text and email alerts – You can get all kinds of different types of text or email reminders for things like if your pet leaves your home safe-zone, or for vaccination, appointments, event reminders, alerts to help you keep track of medications, whether the pet is under active, and to-do lists. These messages can be set up to be sent to all of a pet’s caretakers including pet walkers. Goal Setting – Set a daily activity goal customized to your dog’s age, breed, and weight. Bluetooth capabilities – Lets you see who’s with your dog at any given time. Progress – Learn when your dog is most active and the type and quality of exercise they’re getting and whether it is improving or getting worse. Track Medication You can set reminders for ongoing treatments and vaccinations. Log Food – Keep track of your pet’s nutrition through daily food logging to avoid over and underfeeding; this is useful if multiple caretakers are feeding one animal. Summary Fitbark is a bone-shaped monitor that logs your dog’s daily activity and tracks progress with no monthly fees. It can help users keep their dogs healthy, explain changes in behavior, help you communicate health concerns to your vet, and it lets you compare your pup with similar dogs to help owners understand what an average activity level is for a particular breed. 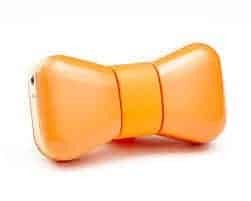 FitBark weights only 8 grams making it one of the smaller devices on the market, but it fits dogs of any size. You can even get it wet, as it is waterproof up to 1 meter for up to 30 minutes. FitBark syncs via BLE whenever it’s next to your smartphone or that of another authorized user. It also has a battery life of up to 14 Days. Whistle also works as activity tracker that will help pet owners keep track of their pooches activity, rest patterns, and fitness goals through easy access from a smartphone. It also lets you keep track of medications, a food log, or make notes of things you noticed that day. The app also has a cool Communication Hub that lets you communicate with family, friends, dog walkers, and anyone caring for your pet. Data is analyzed according to your dog’s size, breed, and age so that you can keep track of their sleeping and activity patterns. This one helps dog owners track, train and ‘socialize’ their dog. The device is a tracker and pedometer for the dog and connects to the owner’s app, but the app can also be used on its own. Dogs can get a profile, while the app does goal setting for health objectives, tracks exercise progress, goals and ‘bones’ earned; gives reminders about medical, grooming, food and playtime and will socialize the dog via a Twitter feed. With reasonable care, you should get at least a couple of years of use out of your activity monitor. Most products come with a 30-day return policy and a limited 1-year manufacturer’s warranty. Since many of these products are relatively new to the market, you will want to test them out as soon as you receive it in case you end up getting a defective device and you can return it hassle free under the 30-day return policy. Ensure you are checking for any signs of damage to the tracker that the pet is wearing to avoid loss of the tracker or general problems that can arise from damage. When reading reviews and doing research, it is essential that any products you are considering have excellent customer service. Since some of these products can be difficult to set up or sync with other devices and you may find yourself looking for support that may be in short supply. Many of these gadgets are pretty new to the market, and some of these start-ups may not have had time to fine tune their customer service, so if you are reading reviews make sure you go with a company that honors the warranty (usually 1-year limited manufacturer’s warranty). Ensure they have a good reputation for replacing parts and most importantly it is easy to get in touch with customer service. The marketing of these pet trackers is exceptionally appealing, they promise pet parents fantastic features that will revolutionize life with your pet, but the reality is that these are new products and some of the devices still have some bugs to work out – so you will need to keep that in mind when you are shopping for a pet monitor. Promised features and reports don’t necessarily work as expected, battery life quite often also doesn’t live up to expectations, and the durability of some products needs to be improved. However, these are some pretty cool tech toys that will go a long way with helping you understand and get your pet healthy. Activity trackers still can’t understand every different exercise and move — but they do a pretty good job at monitoring your pooches overall daily activity level.